OVERLAND PARK, Kan. — Parents working toward a degree at Johnson County Community College can receive up to 95 percent of on-campus child care costs covered as part of a special grant awarded to the school. 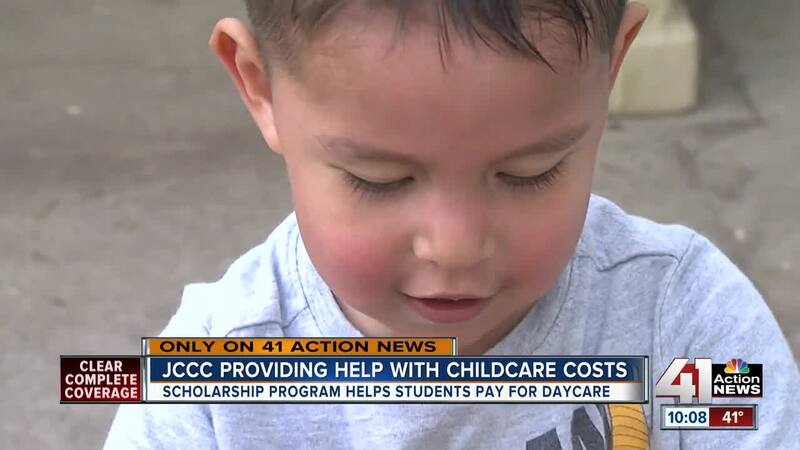 Last October, the community college began offering the Child Care Access Fund Scholarship after receiving a four-year grant from the U.S. Department of Education, which was later matched by the JCCC Foundation. The scholarship covers 75 to 95 percent of child care costs and allows student parents to enroll children 1 to 6 years old at the Heirsteiner Child Development Center on campus. This semester, 26-year-old Maria Chavarin is receiving aid that helps her 2-year-old son attend the daycare. “If you have someone to take care of your son Monday through Friday and you are secure that he is being well taken care of, then you can do much more,” she said. Chavarin is taking economics classes this spring in hopes of transferring to the University of Kansas in the future and working for the Department of Labor. Chavarin’s journey through school has not been an easy one. Aside from dedicating many hours to studying and attending class each week, the single mother also cares for her son and works as a server. She said the cost of child care and school can be hundreds of dollars a week, and she often has to work long shifts to earn a living. With Chavarin spending close to eight hours every Tuesday and Thursday in class at JCCC, she said around half of her total income goes to paying for child care and school costs. After being told that she was awarded the scholarship, she felt a big weight lifted off her shoulders. For other student parents, getting a degree can often be an uphill battle. Heirsteiner Child Development Center manager Claire Ehney told 41 Action News that the parents sometimes have to make tough decisions due to the challenges of balancing everything. With the scholarship now offering assistance, Ehney hoped it could bring an impact beyond the classroom. Any student parent granted the JCCC scholarship must also enroll in a Learning Strategies course and commit to two parenting workshops during the semester. For more information on the JCCC Child Care Access Fund Scholarship, click here.